Cristyn LaChaine and Astro Bock, both sophomores, finished second and third, respectively. Poetry Out Loud is a national contest that encourages the nation's youth to learn about great poetry through memorization and recitation. The program, which debuted in the 2004-2005 school year, has exploded in popularity, with more than 3 million students representing 10,000 schools participating over that time. 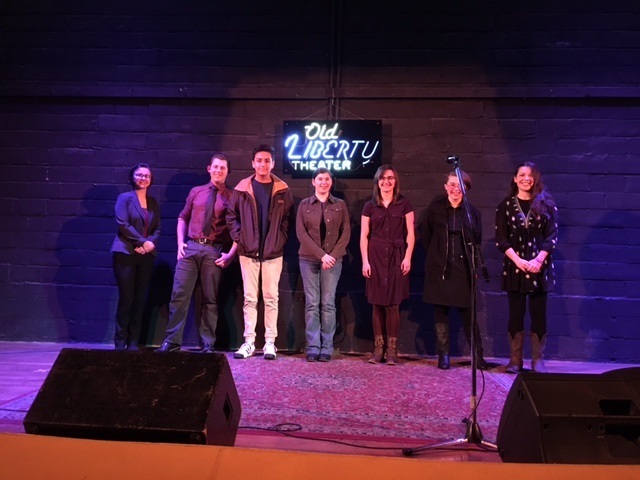 This is the fourth year Ridgefield High School competed in the Poetry Out Loud contest, and members of the English Department continue to be impressed each year with the quality of the presentations given by their students. Brittany Rodin, RHS English teacher and program organizer, agreed. “The students personally select their poems, giving them control over the direction of their literary exploration and a unique opportunity to connect deeply with a single work,” she said. To prepare for the competition, all English students at RHS memorized a poem chosen from an anthology of more than 900 classic and contemporary poems. In the two weeks leading up to the winter break, English classes held competitions where students recited their poems in class. Students were evaluated on their physical presence, voice and articulation, dramatic appropriateness, and ability to convey the poem’s meaning to audience members. Classroom winners and a wild-card advanced to the school finals. This year, students benefitted from the professional guidance of Katherine Murphy Lewis, co-founder of the non-profit arts group, From the Ground Up. Murphy Lewis spent three entire days at RHS presenting a poetry workshop to large groups and then following up with tutoring small groups in individual classes. The English department was able to bring Murphy Lewis in through a grant from the Ridgefield Public Schools Foundation and a generous donation of her time. Finalists deserve extra commendations for their resilience, as multiple snow days disrupted the schedule of classroom competitions and the final round. In addition, the RHS Performing Arts Center was fully booked, preventing rescheduling of the final round there. Despite all of these challenges and the short notice of the rescheduled finals, nearly all of the finalists were able to compete. The district is grateful to the staff at The Old Liberty Theater, who volunteered, at a moment’s notice, to host the rescheduled final round. In addition to extending their hours, they even provided a poster and show tickets as an added prize for the first-place winner. Bochart advances to the Southwest Washington Regional Finals at Educational Services District 112 on Thursday, February 2 at 5:00 pm.